Leading Them To The Rock : Dear Super Mom, take off your cape. No matter hard I have tried to keep that stupid Super Mom cape on, it keeps getting ripped off, or torn, or lost in a mountain of laundry. You'd think the movie The Incredibles would have taught me how impractical capes are, but oh well. It is time to take the cape off, I will never be super mom. And THAT IS OK. God's strength is made perfect in my weakness. I am not Super Mom, but I have a Super God. I don’t want my kids to think I am Super Mom. I want them to think of me as a Mom who loves them unconditionally, with a Super God who loves her unconditionally. When I send the message of Self Sufficient "Super Mom", I am sending the message that I am an independent power, which could not be farther from the truth. I have come to learn the Super Mom cape I put on myself only drags me down into guilt and feelings of inadequacy. Admitting I was failing in my power and needed help to break a cycle of temper was humiliating. But like He does with all things for those who love Him, God turned my humiliations into an opportunity to learn humility...and how to tap into His power. In humility I have to admit I need help... I needed HIS power, not mine. I need HIS Cape, not mine. Be Honest with your kids. There is a school of thought that your kids should never see you struggle, but I think that is a dangerous place to walk. Yes, I want my kids to respect me, and look to me for wisdom, but do they know where that wisdom comes from? Yes, I will strive to make the best choice I am capable of and be a good example, but am I also modeling the ability to admit when I am wrong? Am I modeling dependence on my own strengths or on a much higher rock than I (note the blog title people)? I never want my kids to think that I do any of this on my own power; in case they have inherited my deep rooted independent streak [which is a high possibility], and think they will be able to do this life on their own power. And when I fail [because we all do], I want to show them what it looks like in real life and real failure to ask for forgiveness. I really want to show them what it looks like to earnestly Seek help from their Heavenly Father when they have a recurring struggle. I have been on my knees asking my kids for forgiveness for loosing my temper more times than I care to admit. I have prayed at dinner, through gritted teeth, for God to help me patient. Praise the Lord those times are exponentially less as my Savior grows my dependence on Him. Honesty Begets Honesty. I earnestly pray transparency will one day allow my children the freedom to come to their Father with their sins, and humbly ask for forgiveness. I know my heart would have been mended, and been a little more trusting, if my temper-driven mother had gotten on my level, looked me in the eye, and asked for my forgiveness. Your issue may not be yelling, but I bet you have issue. We all do. We all fall short, we all have holes in our capes. But the beauty is you can always keep growing in Jesus, always working out your salvation and learning to use those most beautiful fruits of the Spirit. He gives us HIS cape. We are HIS creation. We only work in HIS power. 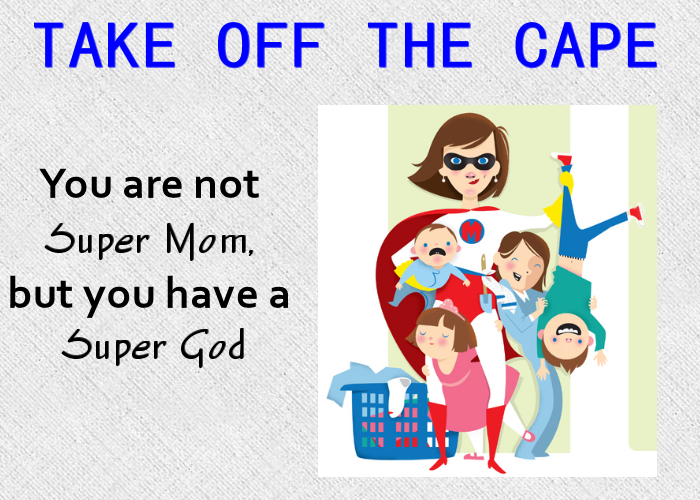 I am not Super Mom, and I taking off my cape to lay it at the feet of my Super, All Powerful God. I stumbled upon this post when looking for balancing life and Prov. 31 women, it was just wanted I need and I actually bible journaled a little bit of it! Thanks for sharing! Thank you Hilary! I appreciate that lessons He taught me could also speak to you, God is so good!